The SanDisk 256GB Ultra microSDXC Card is perfect for recording and watching Full HD video, with room for even more hours of video. Transfer speeds of up to 100MB/s ensure that you can move all your content blazingly fast. 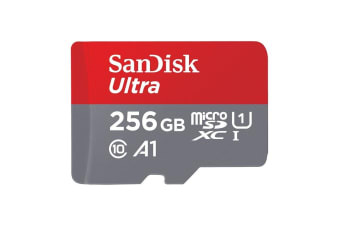 Ideal for Android-based smartphones and tablets, the SanDisk 256GB Ultra microSDXC Card’s A1 rating means that you can load apps faster too. With a breakthrough capacity of up to 256GB, you can store even more hours of Full HD video on the card without worrying about running out of room for the videos, photos, music, movies and other files you want to shoot, save and share. Class 10 speed rating allows you to shoot Full HD video and high quality photos.